ErgoD2® has its own unique specific transporter system within the human body. This transporter is present in the outer cell wall membrane of human cells and is highly expressed in healthy skin, hair, scalp, nails, and lashes. 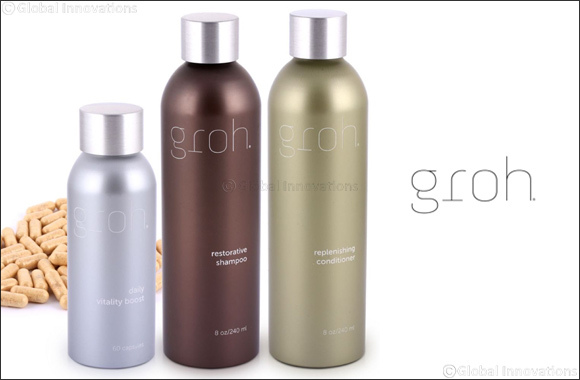 Thus, Groh beauty treatments will work internally and externally within the body's complex biological system to help support healthy skin, hair, nails and lashes. Daily Vitality Boost Supplement (AED 215) – This is an all-natural supplement that offers nutritional support for cellular function, which results in healthier skin, hair, scalp, nails, and lashes. It contains a blend of 6 specialty mushrooms with known health benefits and will help reduce inflammation, boosts energy, and offers nutritional support to strengthen the body's immune system. This powerful supplement will help smooth, increase shine, strengthen and stimulate growth in hair. It will also result in radiant, resilient, younger-looking skin with fewer noticeable fine lines and wrinkles – as well strengthening and stimulating the growth of nails.